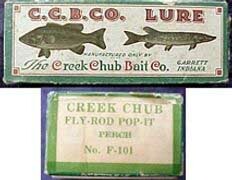 Creek Chub Bait Co. introduced a new line of fly rod lures in 1922 (previously thought to be 1924). They originally decided to number these tiny baits within the regular line of larger bait casting lures. A 7/8" Fly Rod Bug (Trout) Wiggler was assigned the #1000 series while the slightly larger 1 1/4" Bug (Bass) Wiggler became the #1100 series. Two sizes of Fly Rod Pikies were also offered in the #1200 & #1300 series. These four series were NOT designated with an "F" prefix before the series number (e.g. #1000, not F-1000). 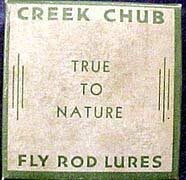 By 1925 Creek Chub added a few more fly rod lures plus some nondescript flies. They also adopted a new numbering system exclusively for fly rod baits. They began with F1 & added new F series numbers as additional designs were developed. Eventually some of the new numbers duplicated bait casting and spinning baits from the #100 through #9600 Original Series. This could have easily caused some confusion when ordering if not for the "F" prefix. 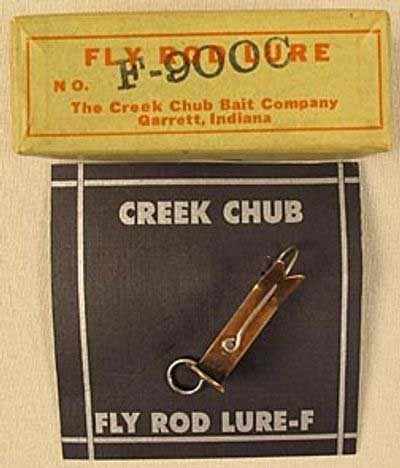 For example, a #100 bait casting lure is a Wiggler in Chub finish whereas #F100 is a Fly Rod Pop-It in Chub. 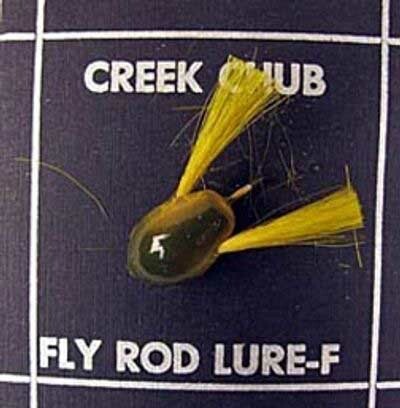 The following group represents the entire line of early catalog fly rod lures offered by CCBCo. It includes the four series offered before Creek Chub added the F prefix. 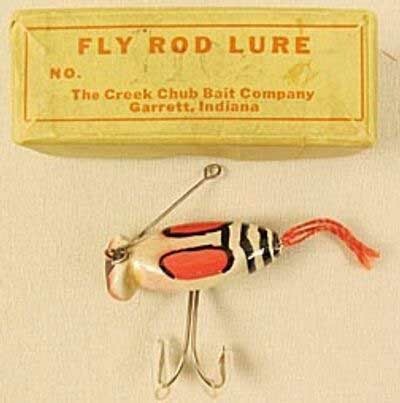 Altogether this company produced 77 different catalog fly rod lures/colors from 1922 until the 1950's. NOTE: This total excludes the generic flies offered by CCBCo. Although studies have been written to describe these flies, they remain difficult to ID. 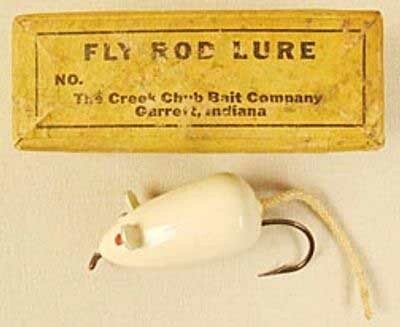 During the 1960s & 1970s, the company also offered some tiny plastic lures designed for spinning & fly rod fishing. These are outside the scope of this study. 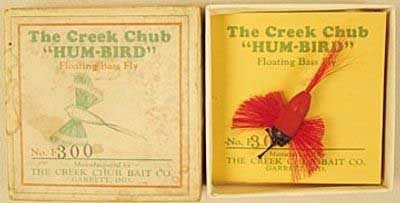 Although several of these series used different color code numbers before 1925, the numbers used here are from the standardized system adopted by Creek Chub Bait Co. in 1925. Many lengths are taken directly from old CCBCo catalogs. Baits were weighed by me and listed in fractions of an ounce. The F10-16 Feather Casting Minnow series is listed here because of the F prefix. It's obvious by the series name, this ISN'T a fly rod lure! It won't be counted as part of the 77 possible fly rod lures/colors. Years: 1924-1933 — Length: 7/8" body plus feathers — Weight: .07 oz. 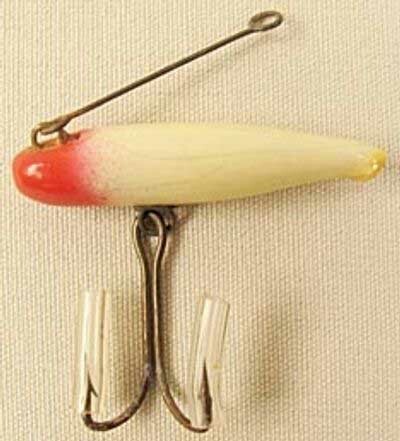 A very difficult bait to find in any color or condition. 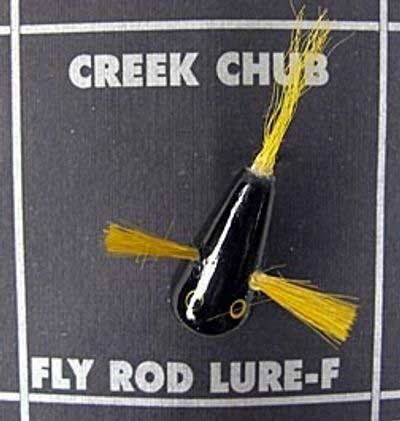 Someone at Creek Chub who named this lure must have possessed a keen sense of humor. 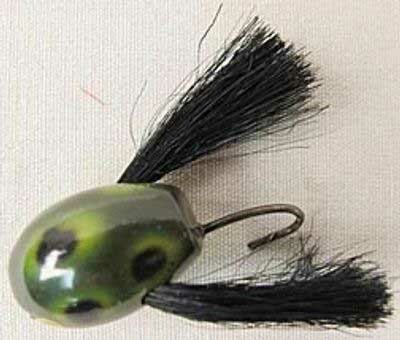 Similar in design to the Feather Casting Minnow, but with a shorter body, no spinner & other subtle differences. Years: 1924-1926 — Length: 1 5/8" body plus feathers - Weight: 1/2" oz. Another inconsistency from the boys at CCBCo. It's obvious by the lure's name it isn't a fly rod bait. I've decided to list it here in case you are trying to identify one. Please remember, this series isn't counted as part of the 77 early Creek Chub fly rod baits/colors. 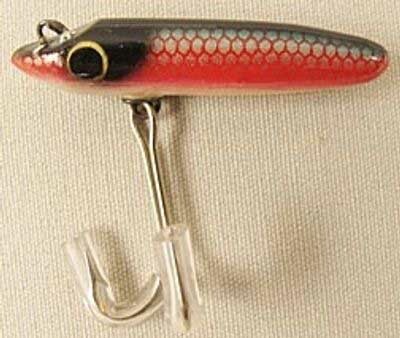 A very tough lure, rarer overall than the similar F1-08 series listed above. A caution to buyers: Check with an unbiased expert on these two series to confirm if the feathers are original instead of recently retied with replacement feathers. Years: 1924-1950 (except 1948-'49) — Length: 1 1/8" body plus feathers/hair — Weight: .06 oz. Not as rare as the previous baits but they are very difficult to locate with all the squirrel tail claws & especially the fragile feather legs & tail. Made in only two color patterns. Years: 1925-1950 (except 1947-'49) — Length: 1 1/8" body — Weight: .07 oz. Most Creek Chub collectors have never seen a complete Froggie. 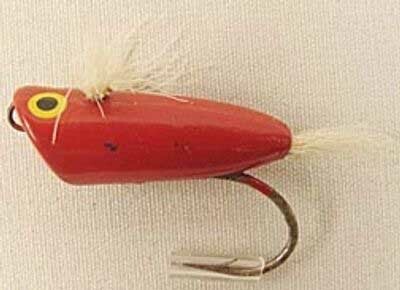 Although the body of this lure is wood, the fragile legs are made of rubber. Over the years these legs either disintegrated or fell off & were lost. Finding a specimen with complete legs, even if they are unattached, is a major coup. F80 was the only color made in 1950. A very scarce "picture" box produced especially for this lure is also known, but is rarely seen. Years: 1927-1950 (except 1948-'49) — Length: 1 7/8" body plus tail — Weight: .04 oz. 99% of these lures are found without some or all of their three fragile flexible fins. Although a specimen without any fins can usually be located without exceptional difficulty, a perfect example in mint condition, with all the fins intact, is a major rarity. Years: 1927-1953— Length: 1" body plus feathers/hair — Weight: .04 oz. This bait incorporates a cork body instead of the usual white cedar. After the paint & varnish work was completed, baits were finished with glitter. Bucktail & mallard feathers were then applied. The feathers were closely glued to the body. Oddly, although Chub color is usually a scale pattern on other lures, it is white on this bait. Perch is solid yellow & Brown Bug is actually brown! This series isn't difficult to find. Years: C.1929-1945 — Length: 1 ¼" body plus tail — Weight: .08 oz. A very difficult bait to find, especially in superior condition. A word of caution: Many lure companies produced a similar appearing bait. Consult an independent lure expert to confirm the company of origin for this little beauty. Years: 1933-1945 — Length: 1" Weight: .02 oz. This series differs from all the other fly rod hard-body lures listed here. It is the only design that is an easily identifiable fly. The body is made of cork & the wings are hair. All color combinations are scarce because this lure is so fragile. A well-known rarity associated with this fly is the "picture" lure box made specifically for this series. Years: 1936-1953 — Length: 1" Weight: .04 oz. This is the only all metal lure in this group. Generally inexpensive compared to other CCBCo fly rod lures. Nevertheless, there are several colors that may take years to locate. Produced in six different finishes & colors. Most collectors mistake the F904 Yellow Scale for the rarer F909 Green Scale. Years: 1922-1945 — Length: 7/8" Weight: .04 oz. This is one of four early Fly Rod Series without the F designation. Don't confuse this with the F1000 Plunker Bass Bug series. Although this design was represented in the CCBCo catalogs for over 20 years, they are quite scarce. Most available examples show considerable use. The Bug Wiggler was produced in three sizes: Two fly rod types & one bait casting size. Years: 1937-1947 — Length: 1" body plus hair — Weight: .07 oz. This is the larger of the two Plunker Fly Rod lures. This one has a concave face similar to the Plunkers in the bait casting & spinning sizes. All of the finishes for this & the F1100 series are solid colors (no scale patterns). A listing of two colors (e.g. F1005 Red & White) denotes a red body & white hair instead of the usual red & white painted body. The Fly Rod Plunker is not often available in either size. Years: 1922-1945 — Length: 1 ¼" — Weight: .07 oz. The second series without the F prefix. Made in the same three colors as the #1000 Bug Wiggler Series, but slightly larger. Again, difficult to find in anything above Very Good condition. Years: 1937-1947 — Length: ¾" body plus hair — Weight: .02 oz. This smaller Plunker Fly Rod lure is similar to the F1000 Plunker Bass Bug except for the wee size & a flat face instead of the usual concave face. Both sizes have through-wire rigging, which is unusual for such small baits. Any listing of two colors (e.g. F1104 Gray & Brown) denotes a solid painted body & contrasting hair. Overall, scarcer than F1000 Series. The F1102 All Gray and the F1104 Gray & Brown are quite difficult to tell apart. Years: 1922-1945 — Length: 1 ¼" — Weight: .04 oz. There were two early Fly Rod Pikie series produced. This is the smaller size. They have a wire staple in the top of the head & many have a wire leader. Examples in Pikie color are sometimes seen. The variations of the F1205 Red Side & Dace seem to be the toughest. No F prefix on this series. Years: 1937-1947 — Length: 1 ¼" body plus hair — Weight: .06 oz. This is another unique shaped bait from the inventive minds at CCBCo. According to fly rod specialists, this is one of the rarest F series, overall. It features a cigar shaped body & perpendicular hair wings that set high on the lure's back. When a lure in this series is listed with two colors (e.g. F1204), the first color is the painted body & the second color is the hair. Seldom seen in any color. Years: 1922-1945 — Length: 1 5/8" — Weight: .06 oz. One of the many sizes of Pikie lures produced by the Creek Chub Bait Co. Similar to most fly rod baits made by this company, generally scarce. 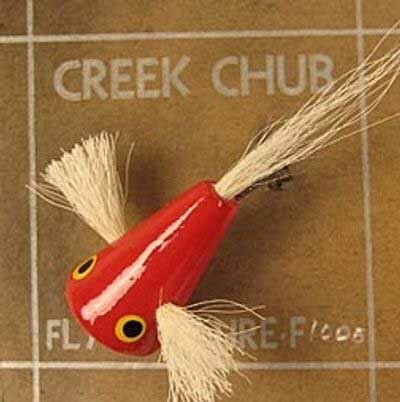 The last of the four series introduced by Creek Chub before they added the F prefix. Years: 1938-1953 — Length: ½" body plus hair — Weight: approx. .02 oz. Overall, a little tougher lure than the F1400 Series Dingbat. Both series made in the same seven color combos. The smallest size of all the casting & fly rod Dingbats. Uses a #6 hook. Years: 1938-1953— Length: 7/8" body plus hair — Weight: .06 oz. All seven colors of this series can be located with an aggressive search spread over a few years. These baits are slightly larger than the F1300 Series. It's amazing how the artists at CCBCo were able to paint such detailed scale & frog patterns on these tiny baits. Uses a #2 hook. This style tiny fly rod box has been dubbed the "Intro Box". However, we know this fly rod box was produced long after the actual Intro Era (1916-1921). The box shown here is marked F-900N which was a fly rod bait not introduced until 1936. These wee boxes were produced in several colors. Most had a slip-on lid. A few end flap Intro boxes are also known in blue. 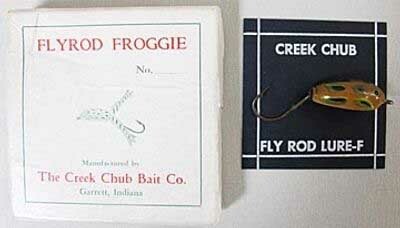 The rare red border CCBCo box was produced for fly rod baits only. Some borders have faded to an orange hue, but were produced originally in red. Certain fly rod baits were shipped in the same color and style box used on many of the bait casting series. Pop-It fly rod lures (and others) are often found in this type of box. The square True To Nature boxes came in two major styles. This is the earliest with three vertical lines on each side of "True To Nature". The most common fly rod box is a similar style with three lines on the sides, over, and below "True To Nature." There are also other minor variations to these boxes. Thousands of the later boxes were thrown out and rescued when the factory closed in 1978/'79. One rare type is a standard True to Nature box with a cut-out in the top. The opening has a cellophane insert. All of the lures named above are catalog fly rod series in standard catalog colors. 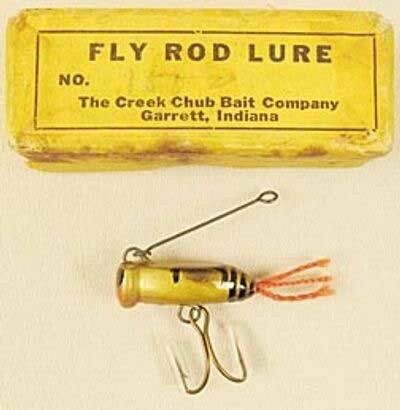 There hasn't been any attempt to list all the non-catalog fly rod lures or the later catalog plastics. It would also be impossible to list all of the never-ending custom order colors known as Specials.